Say Goodbye to Hair Loss Anxiety Once and For All! Why think about the hair you have lost when you can think about the hair you can have? 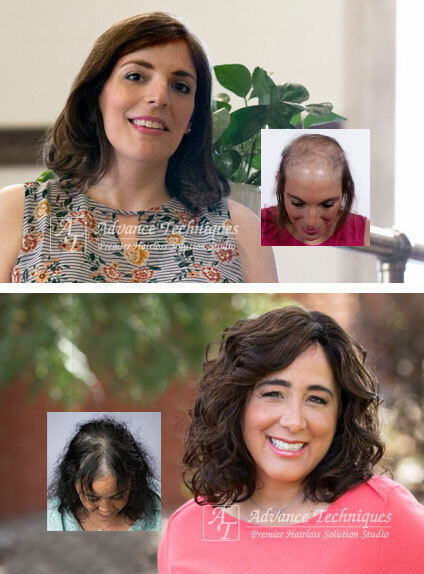 Introducing Reallusions Hair Loss Replacement for Women, the totally undetectable, proven non-surgical hair replacement technology for women experiencing the devastating effects of female hair loss. Our exclusive Reallusions hair replacement for women is virtually invisible to both sight and touch. When you run your fingers through your hair, it is virtually impossible to tell where your custom Reallusions hair replacement begins or ends. With Reallusions, you can restore the natural volume and healthy look to your hair for all manner of hair loss problems, from the minor to the severe. With Reallusions hair replacement for women, the length, body, and hair style you remember is back, and so is your smile. Reallusions is our exclusive state-of-the-art hair replacement system designed especially for women that has successfully bridged the gap between surgical transplants, chemicals and conventional hair loss replacement. Not a wig or hair piece, Reallusions offers a permanent solution to female hair loss without surgery. Not all women want to wear their hair down over their forehead. Reallusions offers a completely natural appearing front hairline, age appropriate density, where the scalp appears normal and visible when the hair is parted, with an uninterrupted scalp. That is, no perceptible change in coloration, appearance or feel between the original hair and scalp and the hair and scalp that has been treated. Your custom Reallusions hair replacement is made with 100% real human hair which has been matched to the exact color, texture, curl and style of your own natural growing hair. Your added hair will be integrated perfectly, and feel just like your own hair. Reallusions was developed through the efforts of Transitions International, the leading hair replacement organization worldwide (of which Advance Techniques is a member). For Women Suffering from Hair Loss and Thinning Hair. Unlike chemicals or surgery, Reallusions guarantees a significant increase in hair density. The Reallusions non-surgical hair replacement system is created utilizing the most advanced women’s hair replacement technology available, is lightweight and virtually carefree. You can treat it just like your own natural growing hair, and live your life without restriction. Reallusions employs a new and improved non-invasive skin like base, creating a virtually seamless transition between your own hair and the hair that has been added. It is virtually undetectable both to the eye as well as to a probing touch. Reallusions’ capability to replace hair in any area of the scalp, and recreate a totally natural frontal hairline, makes it ideal for women suffering from female pattern baldness, alopecia, and trichotillomania, as well as burn and scar victims. Eliminating female hair loss has never been easier than with Reallusions! In as little as one afternoon, you can transform your thinning hair or baldness into thick full hair! Reallusions for Women – it’s more than just hair. It’s a way of life!